If, like me, you're a fan of the original Vegas-based Crime Scene Investigation, you'll be preparing yourself for Grissom's imminent departure. What a character, what a loss. You'll also feel a certain familiarity with that neon Nevada town. More than once the show has harked back to the golden era when you might have caught Frank and Dino on stage. Here in Suffolk, we have our own spin-off: welcome to CSI: Felixstowe. In the midst of our chinwag, chef arrives armed with our all-day breakfast baguettes, and they're atomic monsters: double egg, double bacon, double sausage, mushrooms, calorifically counterbalanced by some bits of lettuce. Can't even figure out a way to pick it up: this is Attack Of The 50ft Sandwich. Many napkins are deployed over the next 10 minutes. 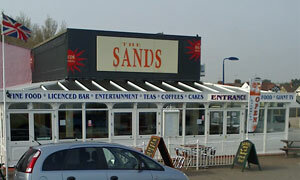 Naturally, The Sands is part of the extended Mannings empire, and there's some great blown-up black and white images of how fings used to be, a bit like this. Plus, of course, some fruit machines at the back. To round off our outing, my latte (with extra shot) is pretty darn good. Bring on the dancing girls. If it was a car -- Banana Splits Buggy. If they were passing by -- Robert David Hall.